KIRSHENBAUM: On the show, we often talk about the relationship between what we eat, our health, and sustainability. VEGA: Right, I mean, your describing the Serving Up Science series itself. KIRSHENBAUM: So, we can’t ignore a new report making headlines internationally that addresses these very relationships. VEGA: The new EAT-Lancet Commission report composed by a commission of 37 experts in nutrition, agriculture, economics, health and government. It includes people ranging from places like Harvard University to the Stockholm Resilience Center. KIRSHENBAUM: Who argue a global transformation of the food system is urgently needed to feed 10 billion people over the coming decades. VEGA: Which returns to those themes we regularly explore together here. KIRSHENBAUM: More people. Limited resources. A changing planet. It’s that simple. VEGA: But the EAT-Lancet report is anything but simple. It calls for some radical changes in what people eat, which has been controversial since its release last month. KIRSHENBAUM: Before we get to that part, let’s talk about the rationale behind these recommendations. VEGA: Diet and health are interconnected – both personally and globally. This report points to research suggesting that eating less meat is better for both. KIRSHENBAUM: How much less meat? VEGA: The authors - including some of the top names in nutrition science - recommend eating less than half an ounce of red meat per day. That’s about 3.5 ounces — a single serving of red meat — each week. KIRSHENBAUM: A lot less than many Americans currently consume. 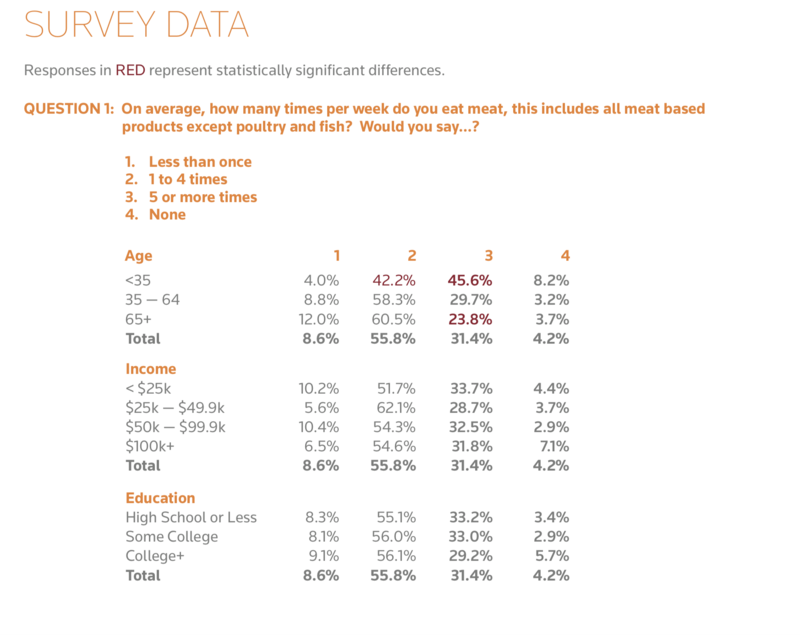 In the U.S. we tend to eat about 2-3 ounces of red meat per day. VEGA: We’re among the highest per capita consumers of meat on the planet… Adding up to about 71 pounds of beef, pork and lamb each year, according to the U.S. Department of Agriculture. KIRSHENBAUM: And more in my wheelhouse, here’s the environmental part: Animal agriculture contributes to greenhouse gas emissions due to production. VEGA: That’s where some of the controversy comes from. Estimates claim the production of red meat is responsible for up to 30 percent of those emissions because it takes a lot of land, water and energy to grow the grains to feed the livestock, making the agricultural sector the world’s second largest emitter after energy. KIRSHENBAUM: And that food for livestock accounts for around one-third of all the grain produced around the world. VEGA: The World Resources Institute has claimed that if you look specifically at impact per gram of protein, beef production requires 20 times the land and creates 20 times the emissions as bean production. KIRSHENBAUM: Although it’s important to note that there has been plenty of controversy over these estimates. So, take that with a grain of salt. VEGA: And then there is human health. KIRSHENBAUM: We know Americans suffer from high rates of cardiovascular disease, stroke, diabetes and certain forms of cancer which have been supposedly linked to diets high in red meat. KIRSHENBAUM: Well the EAT-Lancet report predicts that if there’s a global shift to their recommendations — which essentially means cutting back on sugar, refined grains and red meat — it may prevent an estimated 11 million premature deaths every single year. KIRSHENBAUM: But it’s important to add that the science linking red meat to disease isn’t exactly clear. A lot of compounding factors involving lifestyle, other dietary choices, exercise and more can influence our health, which may not be accurately represented in the research. VEGA: It’s difficult to tease those factors out in health studies of real people outside of a laboratory setting. Although we do know that consumption of processed meats are linked to a higher risk of cardiovascular disease and Type 2 diabetes. That’s according to researchers from the Harvard School of Public Health. KIRSHENBAUM: But overall, the report suggests that limiting per capita consumption of red meat may also improve human health and associated enormous healthcare costs. And the authors additionally suggest strict limits on milk and poultry. VEGA: Not exactly music to the ears of many folks working in agriculture here in Michigan and around the world. KIRSHENBAUM: Remember I said it’s controversial? KIRSHENBAUM: There’s no questions these recommendations would have serious, negative consequences for the industry, and not all scientists agree with them either. VEGA: For example, the Animal Agriculture Alliance released its own analysis in response to the EAT-Lancet report concluding that meat and dairy provide "unmatched nutrition for healthy bodies, brains and bones." KIRSHENBAUM: Not to mention, as we’ve addressed in the past, these recommendations are counter to many popular low carbs diets that are high in protein like Paleo or Keto. VEGA: But while these changes may sound extreme at first, in reality, it’s a lifestyle similar to what considered a traditional Mediterranean diet. KIRSHENBAUM: Which was what MSU nutritionist Dr. Robin Tucker recommended when she sat down with us in studio last year. VEGA: Which brings us to an important place to stop and talk about the details. KIRSHENBAUM: Replacing red meat with, say, white bread and sugar, isn’t going to make anyone healthier. VEGA: Right. It’s not about reducing meat consumption itself, but eating a diet that emphasizes plant-based protein. VEGA: Beans and nuts, which I like, but as a 2012 Thomson Reuters NPR found I, like most Americans, eat meat most days of the week. VEGA: Okay, big picture Sheril. Where does this leave us? KIRSHENBAUM: With more questions than answers at this point. The report itself has raised a lot of eyebrows for good reason. Consider cultural differences globally in diet. Increasing access to animal protein in the developing world. And several unknowns about the feasibility of adoption. VEGA: Listeners can learn more about the specifics by reading the report which we’ll link to you on WKAR.org.But going back to a common theme on Serving Up Science, moderation and variety seem to be key to a healthy diet. KIRSHENBAUM: That means fruits, vegetables, legumes, healthy fats, nuts and seeds, whole grains, some meat and not a lot of sugar. KIRSHENBAUM: And we’ll be following along. You’ve been listening to Serving Up Science; the podcast about food, its origins and impact on the planet. VEGA: This series is produced in association with Food At MSU. I’m Karel Vega. KIRSHENBAUM: And I’m Sheril Kirshenbaum and this is WKAR.